Ex Devon 1979 D series. Originally at Exeter then Seaton. Ex Devon DS. 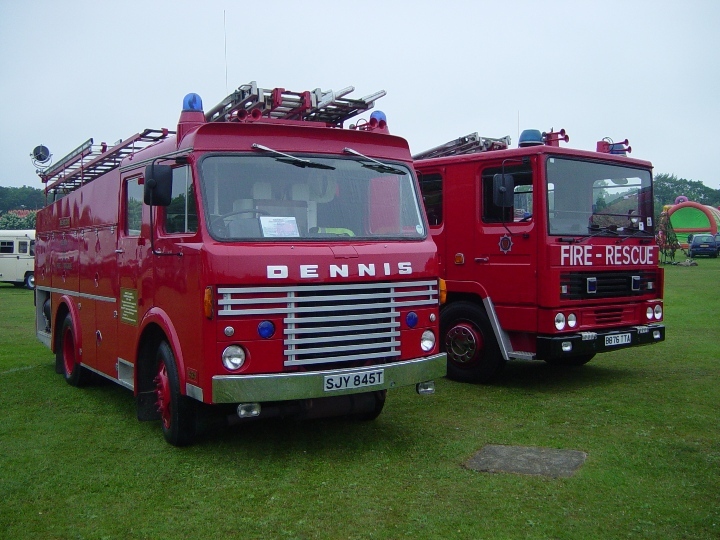 Later sold to Jersey Fire Brigade. This D series was the only one of it's type to have the more modern strobe type beacons fitted, but had them removed prior to disposal. Added by Pavel - Western Australia on 19 March 2008. I believe the strobes were required for new appliances at the time of disposing of the D series but not so at the time of disposing of the DS. Mark. Added by Mark McMullen on 20 March 2008. Not meaning to be pedantic, but the appliance on the right (B876 TTA) isn't a DS. It's an RS135. Added by Ian Moore on 21 March 2008. Not pedantic at all Ian. I realised my mistake after posting it. Thought I'd got away with it too. Added by Mark McMullen on 21 March 2008. Hi Mark, Do you still have the D? I'm a firefighter from Seaton and have been for 12yrs. I am looking to hire its use for our wedding, its beautiful and would love to get in touch if this is possible?! Added by Mike Markham on 22 September 2010. Dennis D series LTT 209P also had strobes fitted to it. Appliance was based at Stn 44 Tiverton. I have the pictures. The strobes were fitted to overcome interference problems on the radio. SJY 845T also served at 44 alongside 209P, both replaced with RS's with conseq plates, A666 and A667 KFJ. Added by Les Colman on 20 November 2011. SJY845T I drove at Seaton, it replaced a split screen Bedford STA302H. Added by Ian Tyne on 31 December 2016.